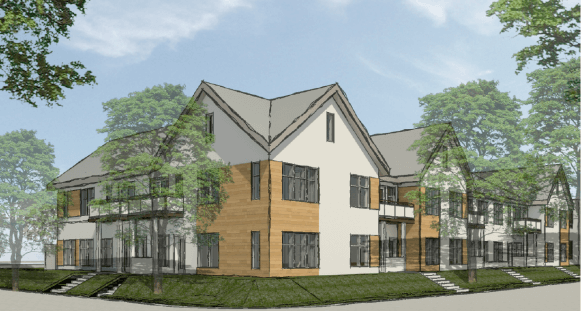 The Garden Terrace Apartments is a proposed multi-family rental development on La Crosse’s near north side consisting of 50 apartments and a 1,500 square foot multi-purpose community center. The development will be split between two sites on 700 block of Kane Street and 1100 block of St. James Street. Fifteen units will be reserved for households who are very low-income, are U.S. military veterans and homeless families. Eight units will be market-rate rentals, and the remaining twenty-seven units will be affordable rentals. The community facility on the St. James parcel will house the Kane Community Hub, a resource that will be open to Garden Terrace residents, the Kane Street Garden and the surrounding neighborhood. This space will feature a multi-purpose meeting space, a catering-style kitchen for activities such as nutritional classes and community meals, and on-site property management offices. The Kane Community Hub also will be a space for Impact Seven’s referral and supportive services partners to have one-on-one client meetings, group sessions and other programming. If the project receives Low-Income Housing Tax Credits in spring 2017, construction is slated to begin in spring 2018.